Work on an emergency diversion route for The Rest and Be Thankful section of the A83 has been completed. The road has been forced to close six times in the past five years after heavy rain washed tonnes of debris down the hillside. Vehicle convoys have been testing the new relief route, which runs along an old military road in Glen Croe in Argyll. It will be used if the main road is again forced to shut. Motorists had previously been forced to undertake diversions of up to 50 miles whenever the Rest and be Thankful was closed. 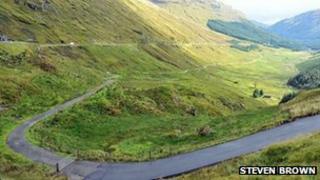 Speaking on a visit to the relief road, Transport Minister Keith Brown said the Scottish government had pledged a further £4m to help improve the A83, including more landslip mitigation work. This funding is in addition to the £3.7m that has already been provided to help tackle landslips and build the relief road. Mr Brown said: "I'm delighted that, following a lot of hard work during some very challenging conditions, we are now in a position to use the emergency relief road. "While some cosmetic works will continue in the coming weeks, the Old Military Road at the Rest is now operational, and we are running test vehicle convoys to ready the team on the ground should we face another unwanted road closure because of a landslip. "The emergency services will welcome this development which will help them to enhance their contingency planning arrangements, and hauliers and locals will also welcome the shorter diversion route which help them realise time and fuel savings." He added: "Our focus through this project to identify longer term measures to address the issue of landslips in the area, has been to ensure Argyll stays open for business." Mr Brown also said a new £5.5m contract to build a bypass at Crianlarich will be put to the market this week.